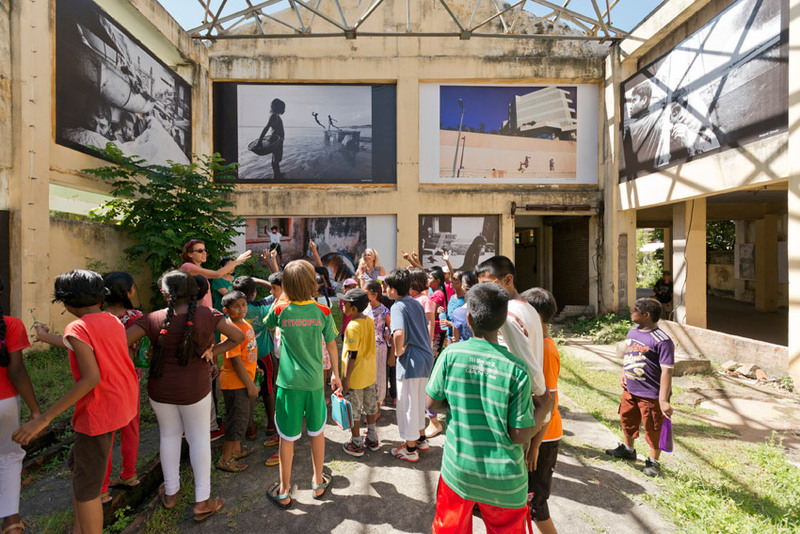 Tuesday, 30 September started with a BANG at the Old Distillery as 2 classes from the French Lycée arrived to look at Pondy ART’s latest exhibition “The Big Indian Street Picture” by Dhruv Dhakan and Swarat Ghosh. They voted on their favourite photos and had a scavenger hunt for elephants and birds in the images. The afternoon was a bit more serious. Tuesday was the last day of Pondy ART’s temporary residence in the Old Distillery and as per request from the Department of Tourism, all the photographs were to be removed. Muthu’s team, our watchman Shanmugan (who is now looking for a new job) and Kasha got to work and pulled down those photographs. It was almost as exciting as putting them up – but not quite. And the day ended with the distribution of the flex to the hut owners near the distillery who could use some waterproofing for their roofs against the soon to arrive monsoon rains. At least the exhibition will make a few more people happy! Over and Out…. for now.